generous dollop of old school, thumb-blistering, button smashing gameplay. played it for the first time. different aspects of the game and that would be an accurate description. and rotating around until you rid the web of those nasty foes. your brain from exploding from the intensity. the scope of the rest of the soundtrack. SFX-wise, things are once again pretty abstract in typical Minter fashion. audio in all DVD games, no question, and T3K takes advantage. variety is the spice of life, you know! and will undoubtedly sell many NUON machines (and probably already has). Ditch the song up in the 80s-90s and it'd be flawless. The closest thing to videogame crack that there has ever been. Addiction is not a powerful enough word. does, but due to massive anti-aliasing there is not an edge to be seen. The anti-aliasing gives the game a very smoothed over, almost blurry look. ever created, and no game could ever possibly begin to duplicate it. claps of thunder and goes on to sound much like "Dark Angel", "Procession"
download "Flash" and remixes of the second song featured on T3K, "Breath". going to be quite unhappy. doubts any game ever will. 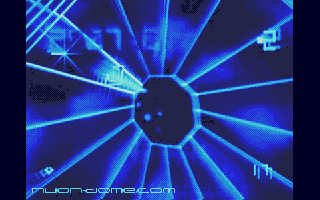 close to a vector screen as you're going to get! the background effects; doing so ensures completely smooth gameplay. find the new T3K music tracks to be worthy. some deranged Speak & Spell toy. 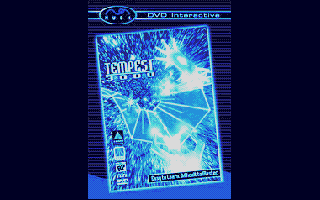 classic Tempest and Tempest 2000 play. (and the Spikes that they build), Fuseballs, and the dreaded Pulsars. break apart looped Webs and refold them into different shapes in realtime. super-size Spikes that can extend beyond the Web's rim! bit (this game is rated E for Everyone, remember?). (because of the gap in firing, which has been mostly eliminated in T3K). other gameplay changes that have been implemented. fire a different bullet which can seek out enemies in neighboring lanes. have to stay steady in its lane and just fire normal shots. the Web and rams enemies rather than just shooting them. where you try to fly through a series of rings without missing one. using hover, or dying all seem to have a negative effect. you land on the Web. more good things to come.